Adaline Bowman (Blake Lively) has stayed single for a long time. She has resisted getting involved with a man for some very personal reasons. She finally meets and falls in love with Ellis Jones (Michael Huisman) a wealthy philanthropist. Adaline and Ellis date for a while, and Ellis takes her home to meet his parents, William, (Harrison Ford) and Kathy. (Kathy Baker) Ellis’ parents like Adaline, but Adaline has a secret, and William figures it out. Will Adaline tell Ellis her secret or will she break off her promising relationship with Ellis? There is a joke about Ted Williams and a horse in this movie, the joke is about as stupid as the secret that Adaline is hiding. The whole movie rests on a gimmicky premise, dressed up with some scientific doubletalk, and bad narration. Not only is it a gimmicky premise, it’s a pretty perverse premise too, some kind of secret male or female fantasy, that really shouldn’t be marketed as a romance, because there is nothing romantic about it. Other than the gimmick, this is a largely conventional romance, and that should be reason enough to stay away from it. To top it off, there is a fake ending, and it ends just the way Hollywood ends all romantic films. It took four people to write this drivel. That speaks volumes about what it takes to write a screenplay in Hollywood. I like Blake Lively, she was surprisingly good in The Town, but in this movie she has to play it like a straight drama, despite the outlandish premise, and so the performance suffers. I like Harrison Ford, he’s a great action star, and a good character actor, given good writing, but he vacillates here between doting husband, and amateur detective, and his character is not interesting enough on either account to make this role worth watching. I like Ellen Burstyn, but her role was too cute by half, role reversal in the extreme, she deserved better. The direction in this movie was horrid, the pacing was leaden, once the audience knows the secret, which happens very early in the film, the audience just waits and waits and waits for the secret to come out to the other characters. The director, who I’ve never heard of, gets bland performances from a great cast, so it must be either, the writing or the direction or both. This was both. The Age of Adaline. Blake is less than lively in the starring role. In reality, Graff wants Ender to lead the military response to the Fomics so badly, that he goes to Ender’s house and personally recruits him to join. The new recruits or “launchies” are first trained by Sergeant Dap (Nanzo Anzoie) but is quickly promoted to a regiment led by Bonzo Madrid (Moises Arias) Bonzo is immediately jealous of the friendship that Ender strites up with fellow cadet, Petra Arkanian. (Hailee Steinfield) The stress of the leadership position is getting to Ender, he is being bullied by Gonzo, and having nightmares involving his sister and the Formics, but his training is going well and enters the final simulation, with the help of legendary fighter pilot, Mazer Rackham. (Ben Kingsley) What are the results of the final simulation for Ender and his crew? I like Ender’s Game. At first, I thought it was just another in a long line of “Chosen One” sci-fi adventures, like Star Wars, or the Matrix, but then I was pleasantly surprised by a better than expected ending. It’s a thoughtful, well-conceived ending. It’s an ending with a conscience, and that makes it better than the typical space shoot-em-up movie. The author of the Ender’s Game series made some disturbing and ignorant comments which will probably doom any more movies from being made, and that’s unfortunate because this is a movie with a lot of potential. Harrison Ford gives his best performance in years as the gruff (what else?) Colonel Graff. Science fiction and adventure tales are Ford’s bread and butter, it’s nice to see him back in a genre where he is clearly comfortable. Viola Davis is less comfortable in her role, and it shows. Asa Butterfield is really good however, alternately tough and sensitive when he needs to be, this could have been a major stepping stone for him, but he continues to build a solid career. He first caught my attention with a heartbreaking performance in The Boy in The Striped Pajamas. Hailee Steinfeld is also very good as a fellow recruit and possible love interest. Ben Kingsley is good as the old hand hero pilot who gives Ender his final training. The pacing is good, the special effects are not overwhelming. Two hours well spent. 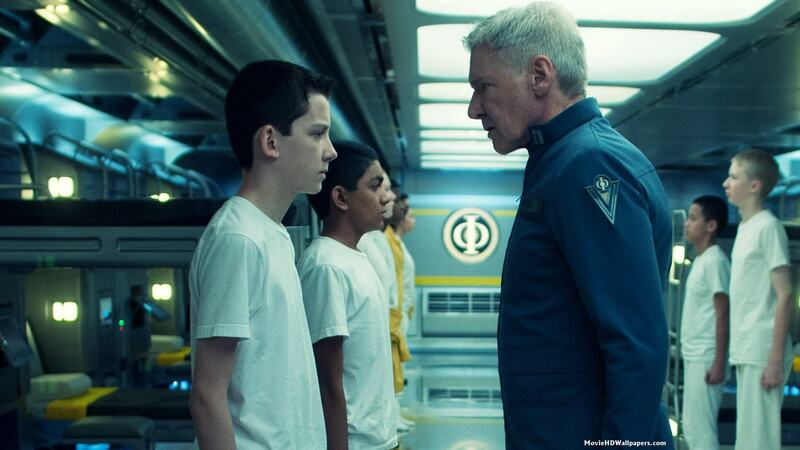 Ender’s Game. The End of a potentially good series.